Ive been a while writing this one.. Nearly 2 years but its still fresh in memory, like it was yesterday, so grab a cuppa as your in for a long one. It's Thursday night and I have finished work I'm making my way back to beautiful Pembrokeshire after spending the week in Birmingham with work. I was getting over the cold I had caught from the kids over the weekend, but I didn't care... It's time to get the game face on get ready it's going to be the biggest race of your life to date. Friday Amazingly I slept like a log I woke up relatively fresh I've made a list of all the things I have to do Friday Saturday and Sunday so I didn't have to engage the brain I heap on more worrying about what race day might bring.I drop my daughter off in Lamphey I made my way to the Friday first race briefing I managed to park the car in the train station which was rammed. I typically forgot to bring change and I car park so I took a picture of the pay and display and paid while I walked my way to the briefing over the phone. When I got to the briefing I totally forgot that you had to where you wrist band to get in a minus to blag my way in and listened to what the voice of Iron Man Paul Kaye have to say. I have read most of the race briefing so I knew I was in store but it was always good to get it read back to you. 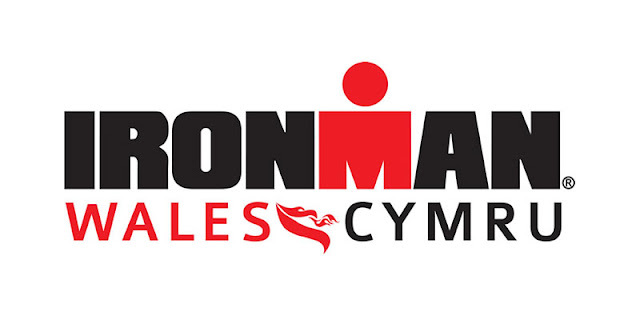 At the end of the briefing I made my way to registration, wristband and ruck sack picked up , I wandered around the ironman store / expo spent a few quid, and being superstitious I packed all Iron Man clobber away and I decided not to get it out until finished the race on Sunday. I wandered into Tenby town picked up a sandwich and then go back to Lamphey the rest of the days seem quite relaxed and put my feet up and chilled as much as I could with two children under 4 years old. 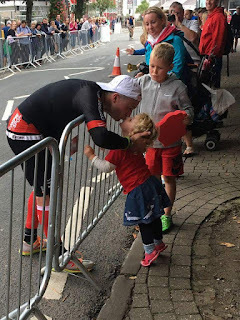 My parents have been amazing during my ironman journey they have had the children of the drop of a hat which has made my training possible and supported me on race day and pre race day. I left the children with Mum and Dad and went back to my house for some rest and pack my race day kit ready for transition on Saturday. 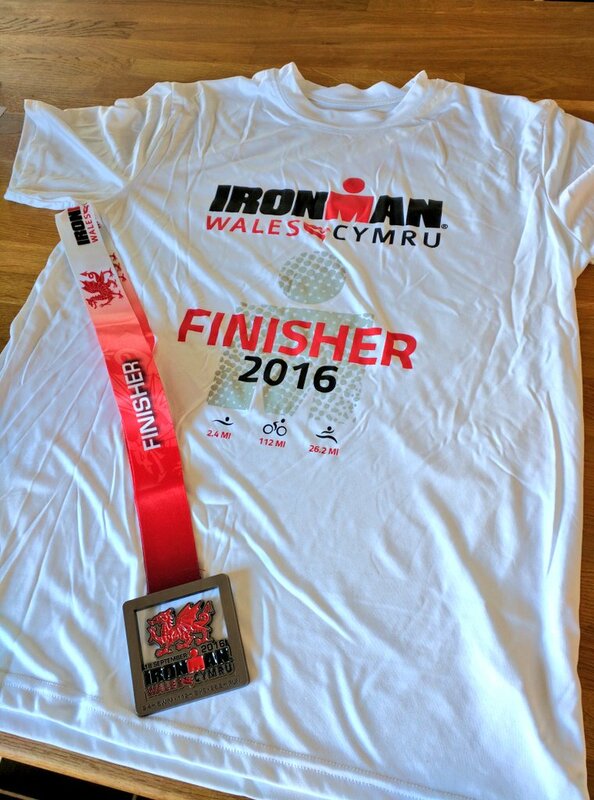 Saturday My wife was racing the triathlon in Saundersfoot so I had the house to myself so I could pack my bags with all kit I needed. This was relatively stress-free and I've made lists prior to the day. I then moved on to my race day nutrition, I have recently moved my time to eat every 20 minutes which seem to work the last couple of training rides so I began to cut Power bars in half so it fitted in my bento box on the bike and I was putting energy gels into squeeze bottles that would fit my bike Jersey (14 gels in total).Everything packed bike on the roof bags in a boot on the way to Tenby ready for transition opening. 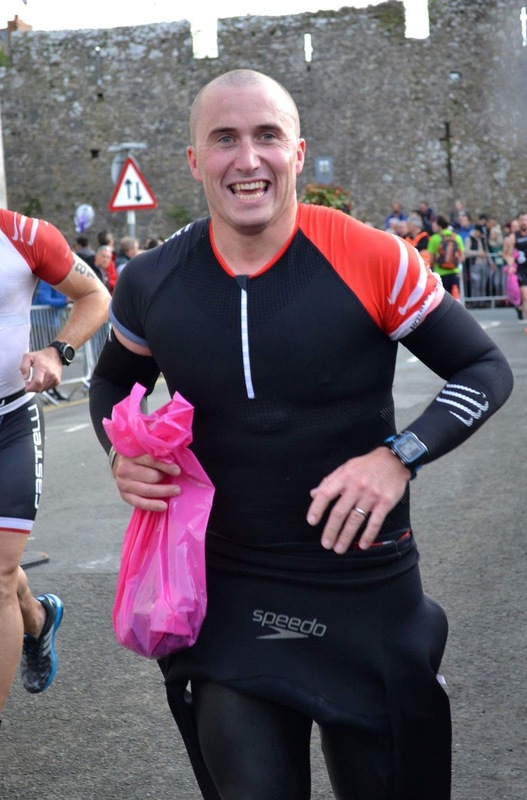 I was meeting my wife Vicki in Tenby she had finished her race, but driving to Tenby I turned into a grumpy Martyn, don't ask me why but unfortunately Vicki had it in the neck about anything and everything (sorry Vicki). We wandered up to transition and then I went into transition andand iron took pictures of the bike I'm guessing this is the Norm and off I went to rack my bike it was quite busy in there and there wasn't a lot of room but I still carried on my bags into the transition tent. I didn't faff I just put things in the right place and got out and went out for some lunch I didn't want to stay on my feet too long the day before race day I didn't know what was in store for me. I saw a few friendly faces I knew around the town wish people luck for tomorrow and made our way back to the car and back home put my feet up. I had my pre race meal of pasta garlic bread and then ice cream and plenty of water, I was in bed by 8 sleeping by 8.30 and the next thing I knew my alarm was going off at 3:30 for breakfast. I hit the water and into the "washing machine" of swimmers, the salt water hits the back of my throat and I'm wrenching for the next 400 meters. I fight my way through the swimmers and find someone that is a similar speed to me and sit on there toes, I hit the 1st boy and its total gridlock, i decided to go wider to try and avoid some of the traffic and it worked, no smacks in the face for me, after the buoy you sigh to the new lifeboat house it seems so far away but your soon at the next buoy and ready to turn to the beach and then use can use Goska rock as your sight. When you look up you can see the masses that have come out to see you swim, its breathtaking.. I hit the beach in a time of 37 minutes, I'm well happy with that, I take my goggles off, give them a lick inside and back into the water I go! I'm still staying with the same few swimmers and keep the pace with them well, there is far less traffic at the buoy so navigating around them is a little bit easier, but swell has picked up and its forced the boats to move out of the swim lane and all I can taste in the water is diesel from there engines. It tastes RANK and I know drinking it wont make my MPG any better, I'm starting to fatigue slightly as I can see some of the group kicking on after the last turn for home, and I'm starting to close my eyes to find my rhythm and only open them to sight every 4th stroke. I can hear the music pumping from the beach, I know I'm getting closer to the beach and I cant wait to get out! I finally put my feet on the floor I'm out of the sea in 01:18:22. What the hell! I had planned for a 90 minute swim and I'm 10 minutes faster! Get in.. take my goggles off, and swim hats and roll my wetsuit down to my waist. I run up the ramp to my trainer bag, poor water on my feet to get rid of the sand and slip my trainers on. The crowds are electric and I can hardly hear from the cheers from all the people that had made it out to support us all. I spot Vicki and Sian on the outskirts of transition, and they give me a high 5 on passing! Into transition I grab my bag and sit down... Its sunk in that I've just completed the 1st leg of a very long day.. I rest a little.. a little to long (18 minutes in fact) I compose myself and off I go to my bike to ride the Pembrokeshire coast and hills to next few hours. I'm feeling good and I know I can do the bike course, I've done it a few times on training rides. Go Go Go! I don't have any issues on riding on my own as i did the majority of my training on my own, but some racers did take the easy drafting options but I wasn't one of them, your only cheating yourself at the end of the day. I gave Vicki and the rest of my support crew a rough order of places and times so I was keen to see some faces I knew and I wasn't disappointed. I hit Lamphey and there was the magical faces I wanted to see my kids! I gave them the thumbs up and I was gone. 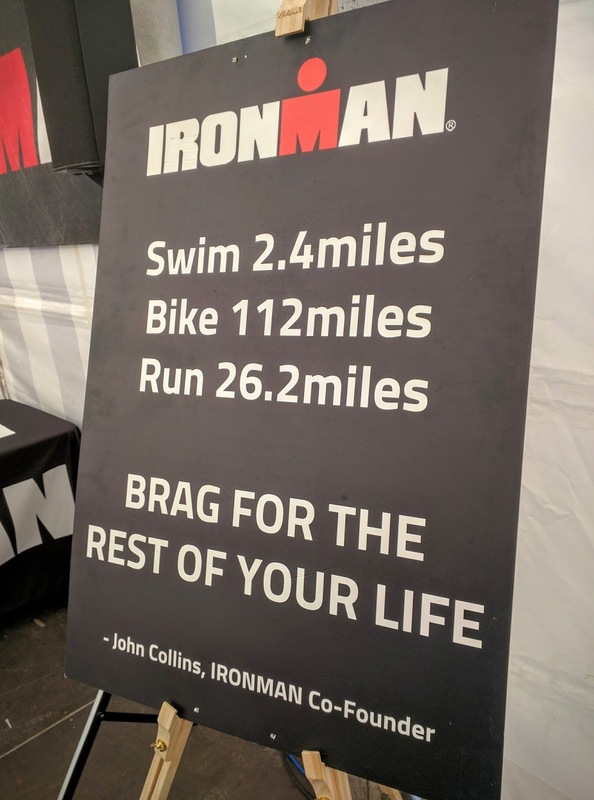 It gives you such a buzz to know you have got people out there fighting this Ironman battle too for you. I find the zone I need to be in and just peddle, I'm not the best climber in the world but I take no prisoners when i go down hill, I haven't had a fall yet so I'm pretty fearless and I tend to pass a few riders on the downhills and get passed on the up hills. I get to Angle fine with the climb out of Freshwater West completed with a few deep breaths and I've drunk 1 bottle of water already so I dump the bottle in the drop zone in the village and get a replacement on the bike without any stress and head back towards Lamphey to see the family again. There is a mass people in Pembroke town which is great and I see a few faces I know and they give me a shout out. Onward to Lamphey and I see the kids, mum, dad, sister in law and my niece and nephew! Its great and a few #Marts2smooth signs too! onwards to Carew, Cresselly and Narbeth, a few climbs in and out of Narbeth and onto Wisemans Bridge, this is the killer hill for the day and you do it twice, I see the sign "PAIN is only a french word for bread" and have a little chuckle, only to find out I'm half way up already, legs feel good and I'm still going, I start to zig-zag at the top for the finally few meters but I know I have to climb this again later in the day so I move onto the next challenge, you can now start to hear the crowd as you come into Saunderfoot and when you hit heart break hill a wall of noise hits you, you forget about the leg pains and burning lungs to climb to the top and you feel indestructible. Now this is the worst part of the bike course for me the climb from the top of heart break hill to New Hedges, It seems to go on and on and on.. after the high from the crowd at heart break hill, I now hit a low, the 1st one of the day and I know I've got to do this climb again and clock in another 40 miles.. C'mon Mart.. Family are in Lamphey ready to see you! I peddle on up the climb towards New Hedges only to see my mates that have come down from Cardiff! I needed them, I was so shocked to see them it was great! 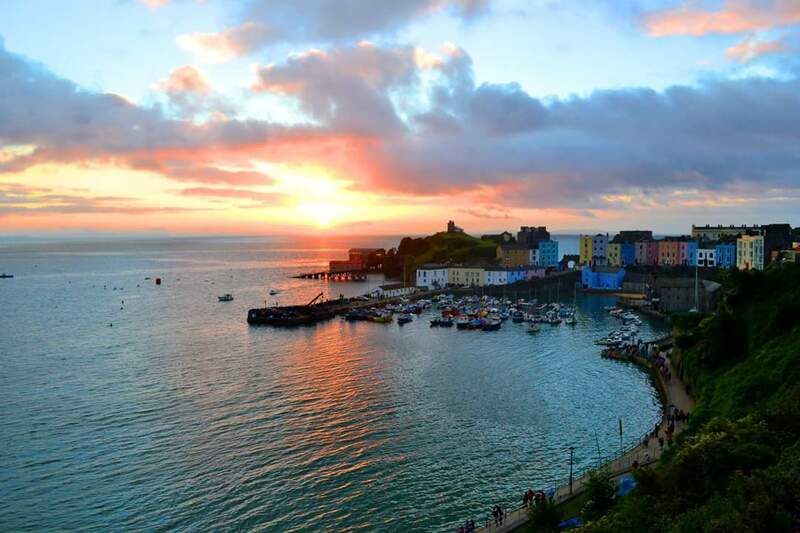 I lifted my head and spun my legs that little bit harder to get out that climb and onward to Tenby. Your legs get a break for a bit while you cycle down into Tenby town, you even get a quick glance at he people at the turn point, the support is amazing here too, even the Samba band are there, a quick look up and onward to Penally, Manorbier and Lamphey where you hit another aid station, a chance refresh the supplies and see some more friendly faces from the village I grew up in. 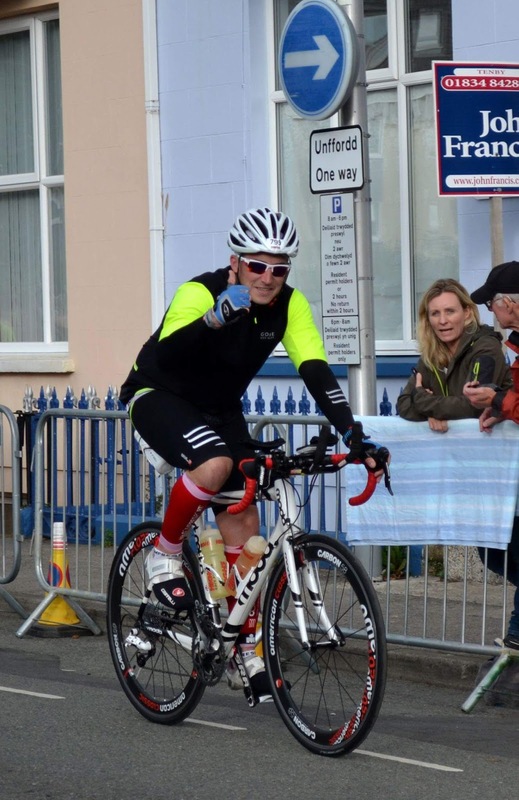 I didn't take any of the gels, I had plenty of food on the bike but i did grab a banana to change the tasted in my mouth which went down well. Back on the climb out of Lamphey and onto Carew and the long drag up to Cresselly, mechanical issues strikes, My chain drops off when I change down, I managed to get it back on, a few swear words later I get back on the bike and start to climb again. I don't find that one too bad, (chain willing) I find the right gear and grind it out and I was starting to pass more and more people, it felt great! The weather gods have been kind as we've picked up a tail "breeze" and its still not raining, I felt positive and I needed to keep in this mindset to climb the final couple of climbs. I then hit Naberth for the 2nd time, and my legs start to cramp, and to make things worse my chain comes off, I hop back on my Moda and I ease off the gas and my legs instantly release the tension, but with this my average speed starts to drop, and I know I've got to climb Wisemans again and get out of Saundersfoot.. and still I've got to run a marathon. I double up on the Zero tablets and hope this can aid with reducing some of the cramps in the legs, but now as I slowed down I notice some of the people I passed in Cresselly start to overtake me back... Bad times... But I forget about this as its my race, I’m only racing myself. I dump my bottles for the last time in Narbeth aid station, grab 2 half bananas and 2 fresh water bottles. I managed to get the tops off and drop in the Zero tabs. As this was the last station for me to get supplies I went for it all and now my mind was switching to the marathon. I hit Wisemans after a speedy decent and I’m straight out the saddle, drop the gears and just spin my legs around it was tough.. I won’t lie.. I was determined to climb it and stay strong even though I think I could have walked up if quicker, but I wanted to make sure I had enough left to get me to T2. 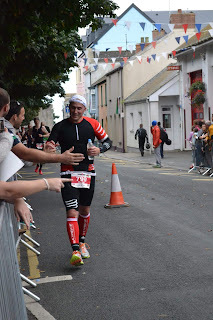 I was definitely getting slower and the majority of the crowds had made their way towards Tenby town centre for the runners, I got to “Heart Break Hill” and the masses of people on my 1st lap had thinned considerably but I didn’t mind and I think my time slowed considerably too but did I care.. NO! I find the next climb to New Hedges my bike nemesis, as i said earlier it’s not the most pleasant part for me but I knew this was the last part, I’m well within the time frame so I wasn’t worried there I was looking at seven and half hours.. My ideally plan was to clock in 7 but I have totally under estimated the bike and if I could do my training again it would be longer rides. I spin into town and see my lovely support crew walking in I get a shout out and off I go to T2. I’ve done it, it was tough but I’ve beaten the cut off and I’m about to get out on the marathon, I hop off the bike at the dis-mount line it feels great to off the saddle, I park the bike up at my race number (none of this pro stuff where you see at Kona or on TV where they take your bike for you ) and I decided now is the time to do a wee, I haven’t done one in 7 hours and I must have drank about 6 bottles of water.. Oh my, it looked like treacle! I’m out the porta-loo and into the transition tent, I park my bum on the bench and a lovely helper comes to me and asks me “Do I need any help” I decline and carry on getting my stuff off and clean stuff back on, I grab a mouthful of salted nuts from my T3 bag, they are the best thing in the world, I needed the salt but they are so hard to swallow as my throat is dry, It takes the time for me to change and leave the tent to swallow them, I take a handful of them as I leave transition, I’ve been 10 minutes in all, that’s a tad bit slow. It feels great at the moment to change body position and stretch out my legs on a run, I know that feeling won’t last, I turn out of the straight from transition and the masses and masses of crowds and noise hit you. The people supporting you is amazing you read about it but when you see it and feel it for the 1st time its amazing, people you haven’t ever met before, strangers, cheering you on it is something you will never forget.. The run is 4 laps of a tough run route, out to New Hedges and back, I hadn’t gone out to run the route in any of my training even though I wanted to, I knew it wasn’t flat and it can be quiet lonely at the turn as the crowds tend to stay in town, I was on my was out and I had decided pre-race to walk the up hills and run the flats and down hills. This tactic was straight into action as the first part of the run is up hill, and after 7 hours on the bike you knew about it. I decided to power walk it so swing my arms as much as possible to keep momentum. I saw the female leader bike coming past me on her final lap into town! WOW! I’ve got another 4 hours + of this running/walking/surviving. I stroll on through the run course and when you get your 1st lap band it feels great, you feel euphoric, I’ve only got to do this 3 more times, I’ve started to load on tortilla chips and coke anything i can get into me, I can’t stomach another gel and that’s what I survived on the bike with., the bananas are going down well too. The run course is still quite busy but you are starting to see more people with 3 or even 4 bands on, this is called “band envy” you wish you were 3 laps in, these damn different colour hair bands. I hit the town centre still up-beat and keen to see my family and friends, I see them and make my way towards them, its that energy boost you need for you to kick on, an amazing feeling better than no other when you race long. I get to the turn point and off out I go for my 2nd run lap, the sun is starting to set and the dusk is starting to land on the run course. I walked the hill out to New Hedges again and apart from that climb I "trotted" the rest of the lap, did the standard refuelling on the lap, coke, tortias chips and bananas, a little water to mix things up. Got my 2nd band and turned back to Tenby, I was still “trotting” down the hill into the town and then a few twists and turns, saw my children, got a kiss and this powered me on and back out to New Hedges, then all of a sudden my left leg cramped up, I’ve never had this feeling before but it stopped me dead. I didn’t know what to do, I tried to stretch it out, it started at eh base of my calf and worked all the way up to the base of my quad...I tried to stretch my quad and my calf tightened up, I tried to stretch out my calf and my quad went tighter... OUCH! I got to the aid station and knocked back 2 cups of the Powerbar energy/isotonic drink wishing it would help me with my cramp, I carried on walking and now noticed that the sun had set and I was going to finish the race in the dark. 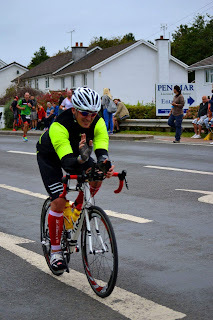 A small part of me wanted to finish in the dusk light after watching every race at Ironman Wales and seeing the people finish, I had pictured me finishing then, but reality is king and I needed to plough on with the job in hand and just get home whatever. I got to band turn point which felt like ages, I took another 3 cups of Powerbar drink and hoped that my cramp had gone, I decided when I hit the main road from the wrist band street I was going to trot again, I needed to get back here again 1 more time, Vicki needed to get the kids home and into bed, they’ve got school tomorrow, I said to myself. I got to the main road and got some decent speed up and hadn’t run for about 15/20 minutes so I needed to make some time up and get into town, I needed that final push to get back out, get that final band and get my magic carpet time! I started to notice other runners with that magical 4th band I was so jealous! I got into the town I saw my wife, 2 children, mum, dad, brother, sister in law, niece and nephew, I started to choke up, these people had come to see me and spend the whole day supporting me.. I felt so lucky to have them there and I needed to make them proud and get this last lap done and show them that all those long rides, double day run sessions, and even longer swims, cancelled day trips it was all worth it. I gave them some power high 5’s and off out I went to finish last lap, into the dark and the runners had now completely thinned out and it started to get quite lonely, I was back walking the hill out of the town, I was power walking and over taking a few people on the climb i had noticed some of these athletes had 1, 2, and some had 3 and I was looking to latch onto one and pull me around but I found myself over taking them, I had a 2nd wind to get home and nothing was stopping me. I could see the turn point and I amazed by the amount of people that were still on the course cheering you on, I tried to keep my pace going but the cramp kicked back in on the incline I didn’t stop i ran through it and it eventually eased and I was making my way to the final band point I stuck out my arm and the volunteer said to me “YOUR DONE NOW GO HOME” It felt great, I was on my way to the red carpet and I hope the crowds hadn’t gone home. I was moving quickest since lap one and my watch battery was on its last 3%, if it’s not on Strava/Garmin it doesn’t count, so I needed to get to the finish before it dies. 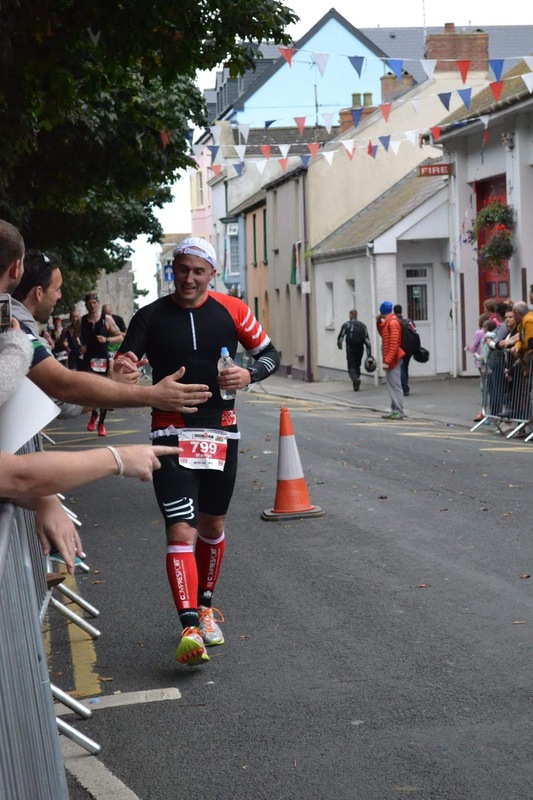 I had passed the point where my family were stood on the last lap and I hope they had made their way to the finish line to greet me, through a few more twists of the town, I could hear the finish line music and the voice of Paul.. I was about to finish, something i had dreamed about for 5 years and trained my heart out for the past 20 weeks, I looked at my watch going under the final arch and it switched off, I didn’t care at this point I just wanted to get it done and my time was going to be above my head in 2 minutes.. No one was behind me and I let the racer in front of me have their solo finish line shots.. I was looking frantically into the crowd to see my family and I heard Vicki shouting to me through the spectators holding a sleeping Iestyn and Evie had retired to the pushchair, I kissed them all and told them I loved them, I looked and my mum and dad and blew them a kiss, and my brother and sister in law hugged me and said get it done (I’m writing this with a lump in my throat) and I looked at Paul Kaye, he looked back at me and gave me the words every racer wants to hear.. I was on cloud nine, I punched the air and crossed the finish line.. I had my medal around my neck, i covered my face and gave myself a little moment, the photographer asked me for a photo and I grimmest as the cramp set in, i needed to keep moving and I made my way up to the finishers tent wrapped in a foil blanket. I had a volunteer follow me up to the tent and asked if I wanted anything, i had a cuppa and 3 oranges and they were the best tasting oranges I had ever tasted.. Well anything would have tasted better than gels, coke and tortias chips. I sat still for about 20 minutes letting my achievement sink in, I ate some more pizza and I looked at my medal it was a good one and there was no way I was taking this one off for a few hours and no the children can’t take it to school. I managed to get up and waddle over to get my street wear kit bag and slowly get out my tri kit behind the changing screen. I saw Vicki in the spectator area and went over to her and hugged her, she told me how proud she was of me, I was chuffed to bits. I asked where the kids were and she told me mum and dad had taken them home, they were shattered. I was about to leave but remembered to pick up my finisher t-shirt, which was a right disappointment. My friends who had done it in previous years had lovely polo shirts with a collar, we got a tee that looked like it was designed by someone who didn’t care and was thinking about £ when producing it.. I was quite disappointed but I sucked it up.. 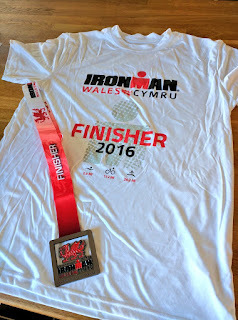 I was an ironman. We made our way down to the car after I collected all my bags and I couldn’t wait to get to bed, I managed to get some super strength and put bike in the car and then started eating some more food, sandwiches which i packed in the car the evening before! Get in! What’s next...only time will tell...? I'm so grateful to my wife and children who had to put up with my lifestyle choice for the previous 20 weeks and put everything on hold to make sure I got around Tenby.